One of the biggest challenges in our calling to spread the Gospel is knowing when to evangelize through words or action. Both, or neither! In our world today, so many are offended by Christianity or any belief that opposes their own. 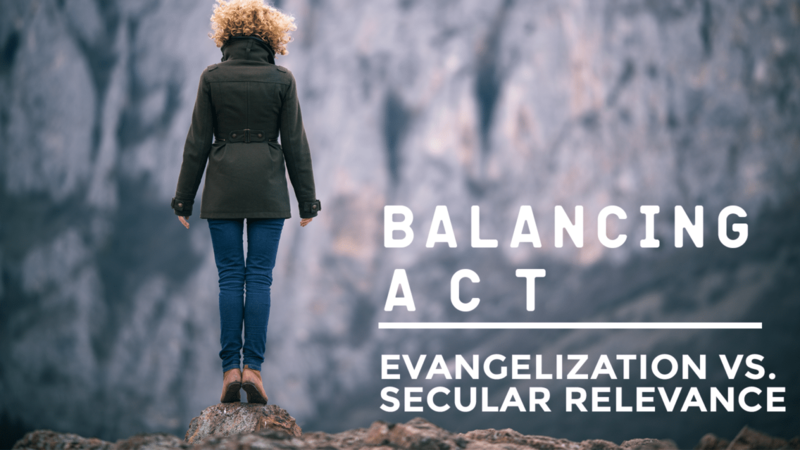 How do we temper bold evangelization with secular relevance? How can we be IN the world, but not OF the world? It’s definitely a balancing act! As Christ-followers, we’ve encountered the true gift of happiness, joy, peace, surrender, and hope. How can we, as individuals, use our gifts, our words, our culture, and our actions to lead others to faith in this modern age? Throughout history, no one shared Christ as passionately as the apostle Paul. Known as the “Apostle of the Gentiles,” one of the things I find most interesting about Paul’s ministry across the world is that he spent time studying each community before ever stepping foot near a pulpit! He learned their way of life, shared in their sufferings. He became one of them, as Christ did for us. He fulfilled the central call of the Christian: to be in the world, not of the world. Once he established real relationships with others founded on love, he was able to speak to them where they were at, sharing the good news in their own terms and secular language. To navigate this essential call of the Christian life, we need to be in tune with the Spirit ourselves. You can’t give what you don’t have, and daily communion with God is like a cup of water we refill if we want to stay hydrated. Actually, it’d be even better if we had a constant IV drip of water, wouldn’t it? How many opportunities pass us by every day due to our own judgment or lack of awareness? And how can we show others who Christ is, if we don’t know Him ourselves? Moreover, if we turn a blind eye to the culture of today, we can miss inspirations of the Holy Spirit to reach others, right where they’re at. If we’re in tune with the world around us and with His voice, He will show us how to minister to whoever He places in our path. There were twelve disciples, and they usually set out two-by-two. We’re not meant to do this on our own. We need others to pour Truth into our own lives. We need accountability. For me, my church community, spouse and deep friendships with like-minded believers fortify my own faith. The people closest to me have authentic relationships with Jesus and challenge me to be closer to Him. Anchored in these relationships, I’m even more equipped to reach out to unbelievers. So. Feel that twinge, that interior whisper? The Holy Spirit is always welling up inside us, telling us to act. Asking us to trust. In hindsight, the rare moments I’ve recognized these “nudges” and stepped out in blind obedience have been moments that surprised me beyond my imagination. Often, God asks me to reach people through secular means, like social media, shooting a quick text, sharing art, creating a beautiful design, recommending a meaningful film. Finding things I have in common with people and getting on their level. One of my gifts happens to be music, so I try to use beauty in my songs to offer people hope – alluding to something greater than just us! Big staples in our culture other than music are food, sports, and social media. How can we transform secular enjoyment into reflections of Christ’s light, opening the way for meaningful conversations? Maybe we conduct our business with a joy that sparks curiosity, make a meal for someone, show good sportsmanship or share an uplifting YouTube video. We may never see the fruit of our seeds, but we should also never underestimate God’s ability to act in the simple! A close college friend of mine once said, “If you’re never around the people who aren’t quite getting it, they might not ever get it.” Every day, we come in contact with people who differ from us. I believe these are souls placed in our path by God. Of course, there are so many traditional ways to be witnesses of Christ’s love – whether speaking words of Truth, praying for others silently, loving in the little things. Even simply listening to others or expressing genuine joy. These inspirations should be part of our daily walk. But I’ve also found that when I’m vulnerable and relatable with people, when I find common ground, they are more open to my beliefs and experiences and I to theirs. When we feel called to evangelize in the moment, 99.9% of the time it’s uncomfortable because of our fear of being unaccepted. But we’re not called to comfort, are we? Was Christ accepted by all? Like I said, I use my art as a channel for God to reach others, writing about honest human emotions – joy, struggle, love, (im)patience, pain, and suffering. Being authentic and relating to others (a la Paul!) creates a connectedness and an openness for God to speak through me, even if I never mention His name. You may use design or your small business as a ministry for others. Whatever our passions, they can be sharp tools in the hands of the Lord if only we let them! Follow the “nudges” of the Holy Spirit – The more you follow them, the more you’ll recognize them.